Strategy: A high level pan to achieve one or more goals under conditions of uncertainty. For our discussion, we will narrow the ‘conditions of uncertainty’ to military objectives. In the case of Napoleon, we will narrow the scope of our discussion even further to focus what is certainly one of the greatest strategic blunders of all time. As General and Emperor, Napoleon accomplished a great deal during his reign. He restructured the French army, rewrote and consolidated the legal codes of the nations he conquered (hello unified Germany!) and attempted to solidify his power by inserting himself and his family into the fabric of European monarchy. Napoleon’s modern army coupled with his logistical superiority made him almost unstoppable. As the European powers raced to catch up with the modern construct of Napoleon’s forces, alliance after alliance found itself repeatedly at the wrong side of the negotiating table. As a result, peace negotiations ended with even higher tensions and more bad blood. European monarchy squirmed at the reality of being bowed by a talented but lowly usurper who came power on the heals of a revolution that decapitated a longstanding monarch. In order to hold on to his power in this climate of mistrust and continual warfare, Napoleon’s political objectives inevitably influenced his military ones. In a final effort to end these repeated alliances formed against him, Napoleon set out for Moscow to deal with tsar Alexander who had turned his back once again on the French Empire. Victorious over the Russian army, Napoleon waited in the burnt husk of Moscow convinced that the tsar of Russia would soon come to terms. But Napoleon failed to realize that the Russians were not playing by conventional 18th century codes of warfare. Theirs was a Total War. A Total War is fought by an entire population with little attention given to conventional codes of military and political conduct (the Russians even set fire to their own capital as they left). The Emperor expected the defeated enemy to reciprocate and surrender. This expectation would end in ruin as Alexander refused to play by the rules. Escaping to Petersburg, the tsar had essentially taken his ball and gone home. If you are strictly a military man unencumbered by the obligations political negotiation, you pack up your army and leave Moscow before the winter comes. The safety of your men and effectiveness of your army comes first. But if you are both the primary political figure AND military leader, things are more complicated. Napoleon stayed, waiting for a negotiation that never came. A tragic mistake to be sure, but the decision itself did not doom Napoleon’s army entirely. When he finally decided to head home, he made another blunder almost as bad as the first. Napoleon’s army would return to France from the same direction from whence he came. This couldn’t of played into the hands of the Russians and their scorched earth policy any better. 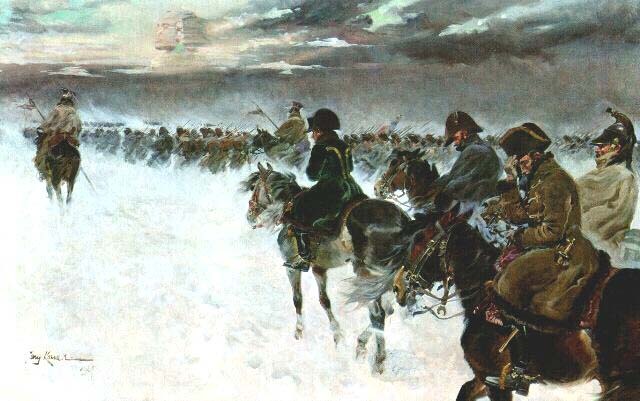 Napoleon’s army deteriorated as it trekked through a wasteland of burnt fields, bloodthirsty partisans, and tracks of land covered by the frozen remains of battles fought earlier in the campaign. Napoleons loss of men, and (according to David Markham) his loss of horses ended his strategic dominance and subsequently his reign in Europe. Why did Napoleon return by the same route? It was certainly a strategic decision in which you can’t point the finger at political obligations. It was a strategic blunder perhaps motivated by fear of the unknown. Were stronger armies south of Moscow waiting for him? These two epic strategic decisions unfortunately overshadowed all of Napoleons strategic strengths. His strengths were many. He was adept at moving fast and meeting armies before they could combine to face him. The modern construct of his army, the strength of the Generals under him, and his brilliant use of artillery on the battlefield made him one of the greatest military commanders of all time. Yet his political obligations ended up contributing to one of the greatest strategic blunders of all time. This blunder will forever color the perception of Napoleon as the milistary strategist.